In memory of David Linley whose memorial service was held immediately after this peal. David was born blind and the sound of the bells ringing always brought him joy. Last updated Sunday, 10 February 2019 at 22:31:34. First submitted Friday, 8 February 2019 at 17:41:19 by Brian E Whiting. 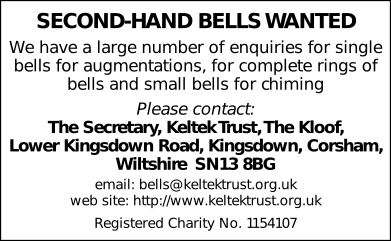 Sent for publication in The Ringing World on Monday, 11 February 2019 at 17:51:05, and printed in issue 5627, page 206. This performance has been viewed 555 times.